On 16th March, Robogals EMEA attended The Big Bang Fair in Birmingham NEC – the largest celebration of science, technology, engineering and maths (STEM) for young people in the UK. The three day fair is jam-packed with interactive workshops, exhibitions, theatre shows, and careers information sessions featuring STEM professionals, to inspire and engage hundreds of thousands of young visitors annually. This award-winning fair aims to show young people (primarily aged 7-19) the exciting and rewarding opportunities that exist for them in the STEM field, by bringing education out of the classroom and into everyday lives. The culminating event to mark the end of British Science Week, this year the fair brought particular focus to the different areas within engineering in celebration of the UK Government’s recent endorsement of the Year of Engineering, a brand-new campaign by not-for-profit organisation, EngineeringUK, to inspire a whole generation of young people. EngineeringUK estimates that at least 186,000 new engineers will be needed each year until 2024 to fill the UK’s current skills shortage, and work on a wealth of new projects to help tackle society’s greatest challenges. Robogals volunteers from the Manchester, LSBU and Bristol chapters ran incredibly popular robotics workshops over the weekend, attracting hundreds of students by deploying a playful, busking robot to engage members of the crowd in a friendly game of ‘pass-the-robot’. The team brought along an Arduino smart car which demonstrated to the entranced crowd how robotic hardware and software interacts to problem-solve the command issued. The computer remote-controlled car, built by EMEA regional mentor, Gabriela Gallegos, was a huge success with the crowd eagerly sharing their experience on social media. 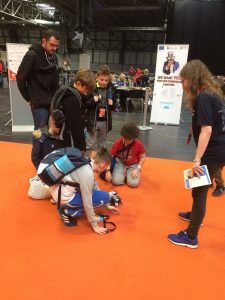 Our team also brought along several LEGO MINDSTORM EV3s robots that proved immensely popular with students, and Robogals workshops were booked out before midday. Students were grouped into teams of 15 by our volunteers and challenged to use the EV3 robots to complete the Line-Follower Challenge. The challenge is simple; teams must program a robot with color sensors, like the EV3s, to follow a black line. However, programming a robot to do what appears to them to be a simple task, usually proves more fiddly than they expected, and it becomes a fascinating challenge for students. Learning both the logic and skills behind programming robots for this challenge helps the students improve their understanding of how robots “think”, and hopefully increases their appreciation for the complexity involved in programming LEGO® MINDSTORMS® EV3 robots. Teams are encouraged to test different approaches to solving the problem and ultimately discover what the working programming solution is. Robogals volunteers were on hand throughout the workshops to supervise teams and guide them through the challenge, assisting students to identify and troubleshoot the problems they encountered. Through patient guidance, the vast majority of teams were successful and received certificates for their achievement to hopefully remind them of the time they partook in a Robogals robotics challenge. 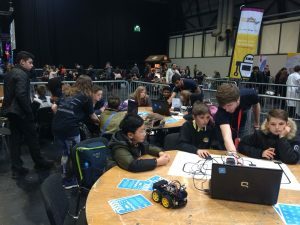 Overall, the Big Bang Fair was a resounding success for Robogals, with our volunteers guiding more than 50 girls and 100 boys through the Line-Follower challenge, engaging countless attendees with busking and showcasing the Arduino Smart Car. 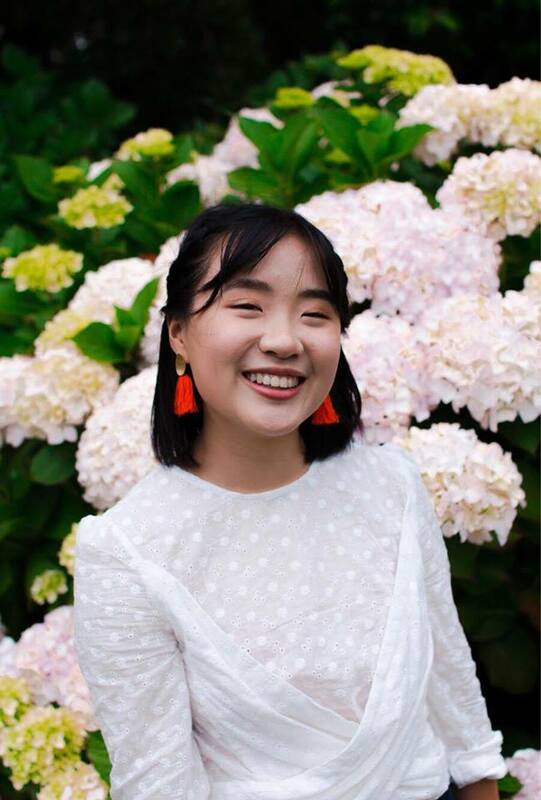 Our volunteers were also approached by several visiting teachers interested in visiting the university-based chapters with their students and finding partnership organisations to assist in running an after-school robotics club at local secondary schools.